There’s a long history of flags with snakes pictured on them, particularly in the United States, where snakes on flags were a very common sight during the era of the American Revolution. Those designs remain popular iconic flags today, due to their striking imagery and symbolism. Several flags with snakes emerged in the colonies between 1754 and 1777, each inspiring in turn the designs that followed them. Although in more modern times the bald eagle became the symbol of the U.S., in the early days of our nation the snake was clearly the dominant flag species. The symbolism of snakes on flags, at least in America, came to represent the mounting colonial resistance to British rule, primarily featuring rattlesnakes (specifically Timber Rattlers) native to North America. The first of the American flags with snakes was not a flag at all! The famous wood carving “Join, or Die” was designed in 1754 by founding father Benjamin Franklin and published in his Pennsylvania Gazette, as a political cartoon commenting on the 1754 Albany Congress and emphasizing the importance of unity among the colonies. It was later used as a rallying message during the American Revolution, when various colonies debated which side of the conflict to take. Franklin’s initial design inspired all of the snake flags that succeeded it, with the rattlesnake becoming a symbol of the American Revolution. The snake’s rattle has 13 segments, signifying the original 13 colonies, and the snake characterized the political climate of the colonies, which would not strike until provoked, hence the phrase, “Don’t tread on me.” Marines mustering in Philadelphia in 1775 began displaying drums painted with the rattlesnake design, prompting an anonymous “American Guesser,” (believed to have been Franklin) to write the Pennsylvania Journal regarding the power of the symbol. Right around this time in 1775 another popular example of snakes on flags emerged: The Gadsden Flag (a.k.a the Hopkins Flag), featuring the classic image of a coiled rattlesnake on a yellow background and the words “Don’t Tread On Me.” The flag is named for Christopher Gadsden, a South Carolina patriot who led his state’s chapter of the Sons of Liberty and later became a brigadier general in the Continental Army. Gadsden, who also served with the Continental Congress and was on its Marine Committee, presented the first officially known incarnation of the flag as a gift to Commodore Esek Hopkins, newly appointed commander in chief of the Continental Navy, as personal standard for Hopkins’ flagship, the Alfred. Gadsden also presented a copy of the flag to the South Carolina state legislature in Charleston, while Hopkins flew the flag on the mainmast of the Alfred during the fledgling Navy’s first missions. 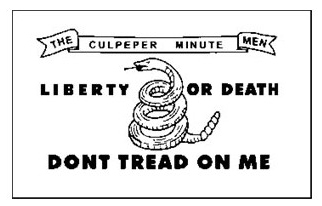 A similar concept of flags with snakes on them was seen around the same time on the Culpeper Flag, also circa 1775, which was designed and used as a standard by the minutemen of Culpeper County, Virginia. 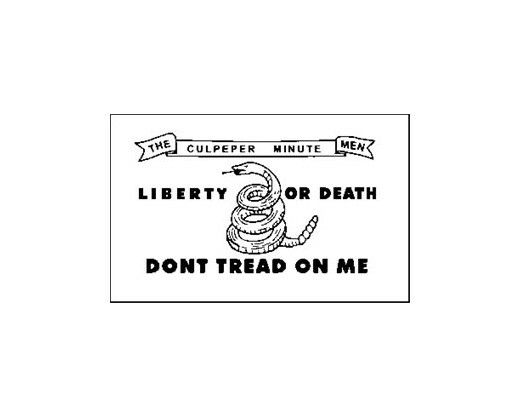 Similar in appearance to the Gadsden Flag, this version also featured a coiled snake on a white background and the slogan, “Don’t Tread On Me,” but also included the phrase “Liberty or Death,” echoing the words of Patrick Henry, who organized the Virginia militia. 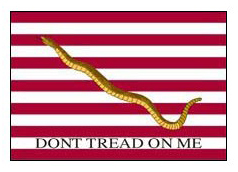 And one of the earliest U.S. Navy flags—the First Navy Jack, circa 1777—was still another example of flags with snakes. 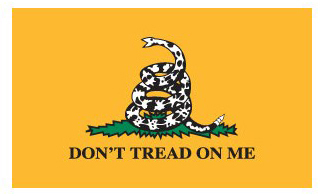 The Gadsden Flag had inspired its design, however, in this incarnation, the rattlesnake in the flag isn’t coiled. It also bears 13 stripes, representing the 13 original colonies. Flown actively as a naval standard, the First Navy Jack remains the current U.S. jack authorized by the Navy and is flown from the jackstaff of commissioned U.S. Navy vessels while moored pier-side or at anchor. Would you like a snake flag of your own? Gettysburg Flag Works offers numerous historical battle and war flags, including the Gadsden Flag, the First Navy Jack and the Culpeper Flag. We also offer custom design options, in case you have ideas for flags with snakes on them that haven’t been created yet! Please visit our website or call 1-888-697-3524 for more information.